Today, becoming a YouTuber is a quickly emerging passion that has taken over the scene. 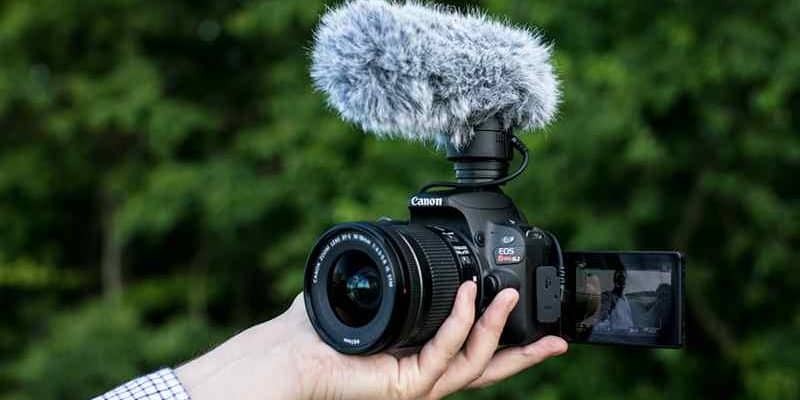 Apart from having the talent and the inspiration to be on YouTube, you likewise also need an excellent camera to record high-quality videos for your channel. And so, how do you choose the best camera for recording high-quality videos for your YouTube channel? A normal 12MP Digital Camera, a point and shoot camera, a mirrorless camera or a high-end DSLR camera? Below, we have reviewed the 10 Best cameras for YouTube. This in-depth guide will walk you through the good and the bad of all the mentioned cameras and will allow you to choose the camera best suited to your needs. The Lumix FZ80 is the best entry-level 4K camera in this roundup. And this stems not solely due to the top of the line specs it offers, but also the price at which you can get it. The FZ80 is a revolutionary camera due to this very point. The number of features it comes packed with at an incredible price point is mind-blowing. The FZ80 is a point and shoot camera that comes with an 18.1MP power OIS lens, helping you capture fleeting moments at up to 30 frames per second. 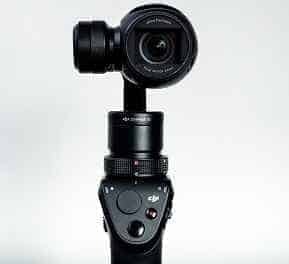 It comes with 20mm wide-angle lens with 60x long zoom, which is by far the best zooming functionality we have encountered in any video camera at such a low price point. 3.0 inch Touchscreen LCD for easy monitoring. LUMIX DFD Focusing system for better and accurate focus. 1080p Video recording at 60 frames per second. 4K video recording at up to 30 frames per second. 4K photo burst and 4K video mode. Ergonomic grip for better handling. The camera also offers amazing image stabilization, that aides in taking better shots and creating better recordings even in low light conditions. 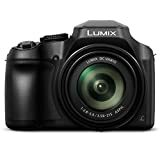 The Lumix FZ80 is by far the best 4K camera for amateur YouTubers or any individual looking for a camera on a budget partially due to its 4K functionality but also as a result of everything else that truly makes this camera a worthy addition to this list. The camera on top of the body has an option to enable “movie mode”, which when enabled, gives you full creative control over how your final video will look. This is a really handy feature on the FZ80 when, ordinarily, you don’t get such level of imaginative controls on any camera at an entry-level price range. The camera easily beats out the similarly priced competition in the zoom department with its 60x zoom capability. While some photos when zoomed to the max might appear a little structured, we can truly appreciate the overall zoom function that Panasonic has added in. Along with the zoom, the camera comes with a 20mm lens, substantial enough to capture a wide range of imagery. The Lumix FZ80 comes with an ergonomic grip which makes it fit flawlessly in your hands. Its viewfinder is clear even in bright sunlight. On the top, you get a dedicated button allowing you to instantly turn on the 4K video mode thus making it quite easy to make a switch between regular and 4K modes. In a nutshell, you get unbelievable value for money. The camera records some really high-quality videos and pictures at great resolution. 60x Optical zoom for capturing far moments. Ergonomic Grip and compact design. 4K video recording 30 frames per second and 1080p recording at 60 frames per second. Dedicated button to turn on 4K video mode and 4K photo burst mode. Comes with a movie mode, so that you can get complete creative controls over filming. The FZ80 is an incredible value for money camera. The inclusion of 4K technology is an absolute steal at this entry-level price range, allowing you to record high-quality videos at an amazing frame per second rate. If you are just starting out with YouTube and do not want to blow a large amount of cash on a camera, then this your best bet. Share your creative vision through your videos using this astounding camera from Nikon. Nikon D7200 is the brand’s first camera that comes with both leading wireless technologies i.e. Wi-Fi and NFC. The Nikon D7200 provides solid competition to all of the cameras listed here, whether it is the Canon EOS 80D or the high-end Mark Series. 51 point autofocus system designed for faster focusing on objects. So, what other features make it such a special camera? Well, let’s find out in our review below. But before that, let’s have a look at the specifications. Expeed 4 processor for better and faster processing. Records FHD 1080p videos at 60 frames per second. Shooting capacity of up to 6 frames per second. Equipped with No Optical Low Pass Filter. Integrated Wi-Fi and NFC for Seamless sharing and Remote Control. The Nikon D7200 comes with a 24.2MP CMOS image sensor that helps in capturing videos at up to FHD 1080p. It comes with Nikon’s revolutionary No Optical Low Pass Filter and the latest wireless sharing technologies Wi-Fi and NFC. The camera comes with a 51 Point autofocus system that provides great attention to detail while filming videos. The autofocus points are well spread across the whole frame and detect objects seamlessly. With advanced functionality to records videos at up to 6 frames per second at continuous shooting, the camera is also perfectly suitable for YouTubers that are going to record fast-moving action like sports or wildlife. Equipped with an optical low pass filter, the Nikon D7200 delivers remarkably sharp photos and videos. The 24.2MP CMOS picture sensors that join the Expeed 4 processor and Nikkor focal points, upgrades subtle elements and allows for significantly better visuals. The Autofocus system in the Nikon D7200 is overall awesome. Regardless of whether you are working in sunlight or low-light conditions, the Autofocus framework will dependably have exactly the intended effect. The advanced multi-cam 3500 autofocus detection in the D7200 achieves excellent focus detection even at a very dim -3 EV (ISO 100, 20C/68F). The addition of Wi-Fi and NFC is actually a great idea and is very useful when it comes to sharing content from your camera to other devices. With the D7200, this goes a further step since you additionally get the opportunity to control the camera through your mobile phone and can likewise examine the live view. The last thing that we would like to mention is the battery life. The range is phenomenal, and you can easily expect usage of 5-6 hours on a single charge. Excellent Battery range of 5-6 hours. 1080 full HD videos at 60 frames per second. Expeed 4 image processing & 24.2MP powerful DX-Format sensor. Comes with both NFC & Wi-Fi for sharing and controlling the camera right from your mobile phone. The Nikon D7200 FX is an excellent camera for YouTube that can record FHD 1080p videos at 60 frames per second. It has some unique features added to it like the No optical pass filter and Expeed 4 image processor which makes processing much faster. We highly recommend this to anyone that can work this into their budget. The Sony a7R II is the most powerful camera for YouTube among all of the cameras listed on here. Period. The A7R II is a full frame, mirrorless, interchangeable lens camera that is truly exceptional in every way. It comes with the world’s first full-frame, back-illuminated Exmor R CMOS 42.4MP Sensor, 4K movie recording and 5 axis-in-body image stabilization. A majority of the people today believe that a DSLR camera is probably the best camera available today for YouTube and while this may have been true in the past, we’ve not got Mirrorless Cameras. Mirrorless cameras are very compact, lightweight and non-bulky when compared to DSLR cameras, and yet have all the excellent features that make DSLRs so popular. Case in point being the Sony a7R II – a Mirrorless camera, that easily wipes out all high-end DSLR cameras here. Full frame, back-illuminated 35 mm Exmor 42.4MP CMOS Sensor. 4K movie recording with full pixel readout and no pixel binning. Fast Hybrid AF with 399 focal plane phase detection. Integrated with Wi-Fi and NFC for seamless sharing. 2.4 Million DOT XGA OLED Tru-finder. ISO 102, 400 and 4K Up to 25, 600. Strong Magnesium alloy body and lens mount. What can we say that hasn’t already been said? Only one word comes to mind when trying to describe this camera – Perfection! The Sony a7R II is a keeper. With competitive power-packed features that make for a truly amazing camera, you won’t feel the need to replace it for a good long while. Ideally built for professionals, that this is probably the best camera you could get to create amazing, high quality, professional content for your YouTube channel. The 35mm Exmor CMOS Sensor is the World’s first full frame sensor with back-illuminated structure. The structure is made by a combination of gapless on-chip lens design and AR coating on the sensor’s glass seal along with the revolutionary no low pass filter to improve light collection efficiency. The a7R II comes equipped with 4K for amazing videos . A combination of a full-frame image sensor in 4K, with direct pixel readout, and no binning results in better overall video quality. Fast Hybrid Auto Focus with 399 phase detection Autofocus points and 5-axis image stabilization favors the 4K and takes movie making to another level. The camera offers seamless connectivity to your mobile phone or Tablet via Bluetooth or NFC with the PlayMemories mobile app. This allows you to fully control your camera, frame your image using your mobile device, turn on the camera shutter or movie button, etc. You can also transfer videos to your mobile phone or tablet simply by one touch. The Focus capability on the Sony a7r II will simply blow your mind. The new full frame image sensors make sure that you get the highest number of focal phase detection AF points and the widest coverage possible. The fast hybrid autofocus system with an additional 25 points improves accuracy and tracking even at 5fps continuous shooting at 42.4MP. The focus is spread across the whole frame right up to the edges, instead of being clustered in the center, which is a huge plus point this camera has over the other. The build of the a7r II is robust, designed for reliability and a strong grip. The a7r II also features a solidly built lens mount allowing you to mount large lenses to the camera, which, it will ultimately hold very well. Articulated display for easy live monitoring. The robust and compact Body structure. Fast Hybrid Autofocus with 399 focal Phase Detection. The Sony a7R II is the ultimate YouTube camera, ideally built for people who want to record highly professional videos. Being a mirrorless camera, it is very compact in nature. We would definitely recommend this to anyone who wants the absolute best with no compromises. The Nikon D3300 is the most successful camera from Nikon’s entry-level DSLR line. The D3300 comes with a powerful and advanced 24.2MP DX-format sensor with a capability of shooting up to 5 frames per second at high-speed continuous shooting. The camera can record 1080p videos at 60 frames per second with soft blurry backgrounds and tack-sharp details. The display added is a fixed, 3.0 inch, 921k dots display that is vibrant enough for testing out shots taken. The camera comes with an ISO range of 12800, which can be upgraded to 25600. Up to 5 frames per second continuous shooting. ISO range expandable up to 25600. 11 Autofocus points with 3D tracking. 3.0 inch, 102 ppi fixed display. The Nikon D3300 is packed with an 11 points system and a single cross-type sensor, which might not be best for recording sports or quick action videos, but does a great job recording daily vlogs and YouTube videos. Videos are very smooth and the camera offers good low-light performance. The Nikon D3300 is available in 3 different color variants: Black, Grey, and Red. We would recommend getting the Grey one as it’s quite low profile. The 24MP sensor can record sharp 1080P videos at up to 60 frames per second and can perform high-speed shooting at 5 frames per second, which is amazing considering the price point of the camera. You can instantly preview videos and pictures on your smartphone, share them on your social media accounts, send them via email or simply save them to your drive with an optional Wu-1a wireless adapter. With the help of the adapter, you can also control your camera using your mobile phone, which would be very helpful in monitoring angles while taking self-portraits. Equipped with an Expeed 4 image processor allows for much quicker data processing. The video quality is fantastic and looks good on all devices. For audio recording, you do get an inbuilt microphone in the camera but if you want even better audio recording, you have the option to connect an external microphone to it. 11 AF points with 3D tracking. Full HD 1080p recording at 60 frames per second. High-speed continuous shooting at 5 frames per second. A great camera from Nikon and very well priced for the users, it comes power-packed with most features that you will need and almost no issues. Unless you want a camera for professional filmmaking, we would advise you to save yourself a few bucks and opt for the Nikon D3300. 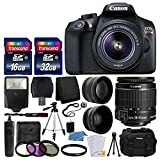 Canon EOS 80D is the sequel to the EOS 70D and one of the best digital SLRs from Canon and also a favorite of some of the most popular YouTubers. The camera comes at a great price point and offers all the excellent features that a camera should have. The EOS 80D camera comes with a 45 points all-across Autofocus system, providing the best focus experience when working with focus area selection modes or optical viewfinder. When it comes to the CMOS sensor, the EOS 80D comes in with a 24.2MP APS-C sensor, which can create high-resolution videos. It also comes with dual pixel CMOS autofocus, which helps in shooting videos with accurate and fast focus. High-speed continuous shooting up to 7 frames per second. Faster and better Digic 6 processor for better video quality and faster processing for zero lag experience. Up to ISO 25600for brilliant video recording, even in low light conditions. 1080p video recording at up to 60 frames per second. Built-in NFC and Wi-Fi for quick connectivity with mobile device and laptop for sharing content. Anti-Flicker technology provides consistent exposure in the case of flickering of surrounding lights. Overall, the EOS 80D is one of the best cameras for YouTube that you can get. The 3.0 inch articulating touch screen makes it super easy to focus with an easy tap. The battery life is satisfactory and will not be an issue even if you are out shooting for multiple hours. The Intelligent viewfinder on the EOS 80D provides a comprehensive and bright view taking out all the guesswork with 100% coverage, allowing you to get the right show at the right time. The Autofocus on the Canon EOS 80D is brilliant. The Dual Pixel CMOS Autofocus delivers fast and accurate focus while shooting videos. Dual pixels work like a charm with video recording, helping you achieve a natural and precise focus, even when shooting fast action videos. Furthermore, you get a 45 points cross type autofocus system with a full frame sensor which is fantastic. The autofocus points are really fast and accurate. On top of that, you get 7 frames per second at high-speed continuous shooting which is extremely helpful in recording fast action videos such as sports or athletics. The camera comes with a headphone jack. This allows you to monitor audio levels while recording videos and adjust the audio levels without having to look at audio graphs on a separate screen. In terms of wireless connectivity, the Canon EOS 80D comes integrated with Wi-Fi and NFC for seamless sharing of photographs and videos to your mobile phone, tablet or any other Wi-Fi or NFC enabled device. When it comes to low light performance on the EOS 80D, the camera features a wide ISO range of ISO 100 – 12800 (expandable to 16000/25600), that helps the camera perform brilliantly in low light conditions even with no flash. The Digic 6 processor is one of the latest and fastest processors from Canon. 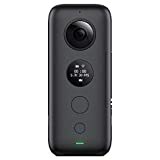 It delivers excellent processing, full resolution high-speed continuous still shooting and distortion connection in camera. 45-point all cross-type AF system. 1080p FHD video recording at up to 60 frames per second. Inbuilt Wi-Fi and NFC for seamless sharing. Up to 7 frames per second capture in a high-speed continuous shot. Barring the Mark series, the EOS 80D is the finest camera for YouTube that Canon has to offer. The Autofocus especially makes it a great choice for YouTube and more so for Vlogging. This should come as no surprise since the EOS 80D is widely used by popular YouTubers and so we strongly recommend checking it out! The Mark series has been known for offering some of the best professional cameras out there and the G7 X Mark II from the series is another camera widely used by some of the most popular YouTubers. The G7 X Mark II comes with a 1.0 inch, 20.1MP CMOS sensor, along with a Digic 7 processor, which delivers at a lightning fast speed and helps in processing amazing images even in low-light conditions. The Canon G7X is a point and shoot camera that easily fits in the palm of your hand and still manages to showcase amazing features that are commonly associated with DSLR cameras. 1.0 inch, 20.1 Mega Pixel CMOS Sensor. Canon’s new and improved Digic 7 Image Processor. High-speed continuous shooting at up to 8 frames per second. 1080P Full HD video recording at 60 frames per second. Multi-angle 3.0 inch LCD screen. Seamless wireless connectivity to a mobile phone via Wi-Fi and NFC. Unlike the EOS series, the G7X is very handy and could be the best Vlogging camera on the list. Its Handycam reminiscent design makes it really compact and easy to handle. G7X Mark II can record up to 8 frames per second at continuous shooting, which is better than the EOS 80D. The ability to record videos at 8 frames per second helps capture fast moving objects easily whether you are shooting wildlife, fast action like sports or any other quick motion content. The camera also comes with the Canon HS system which helps in capturing bright and beautiful videos. Adding to this the 4.2x, f/1.8– f/2.8 Optical Zoom Lens, you now get to maximize the content in your frame with swift precision. The camera can record up to 1080p full HD videos at 60 frames per second, which can be monitored on its 3.0 inch LCD screen that tilts up to 180 degrees for easy live viewing. You do get built-in NFC and Wi-Fi allowing you to share videos seamlessly, as well as control the camera remotely through your mobile phone. Up to 8fps High-speed continuous shooting. 3.0-inch tilt-type touch panel LCD. Compact design that would easily fit in the palm. Camera Connect for remote shooting and monitoring. 1080P DHD recording at 60 frames per second. Battery that comes along only lasts for 3-4 hours on continuos recording. This is one powerful camera considering what you pay for it. If you are a fan of the Mark series, perhaps the 5D or 7D, but find them quite expensive, then the G7 X Mark II is your best bet. It provides stiff competition to the EOS 80D and yet sports a comparatively cheaper price tag making it a popular choice for several of the biggest YouTubers around. Still reading through this list? This next camera is sure to please! Next in our countdown is the Canon EOS 70D, a DSLR that stands on an excellent market reputation. EOS 70D is the predecessor to EOS80D and is currently available for a lower price than its successor. To compare, it comes with a 20MP sensor, while the EOS 80D comes with a 24MP sensor. With the EOS 70D, you get a 19 points cross type autofocus, while with EOS 80D offers up a 51 points cross type autofocus which is amazing. Though the EOS 70D is not superior to the EOS 80D, when compared to other cameras it certainly holds its own. 20.2MP APS-C CMOS sensor and DIGIC 5+ Image Processor, an upgrade to the one on the Canon T5. Capable of up to7 frames per second shooting while recording. Dual Pixel CMOS AF for better and quick focus on videos. 3.0 inch articulated LCD screen with 1040k dots. Full 1080p HD recording at up to 30 frames per second. Built-in, a great quality microphone that makes Vlogging much easier. Apart from the amazing specifications, the camera also brings great build quality and design to the table. It comes with some a pretty cool leather finish on the top that compliments its design really well. The articulation LCD screen is the probably best feature of the camera. Regardless of where you view it from, you get a pretty clear view of the display. Plus, with an easy tap, you can adjust the focus level, amongst other properties. 11 AF points are precise and sense objects in Snap. And with 7 frames per second rate at high-speed continuous shooting on the EOS 70D, you are guaranteed amazing visual content. The facial focus in exceptional and can be used to create that great blurred effect in portrait videos. The microphone is decent and pretty straightforward and while it can certainly be used to record sounds, we would recommend a dedicated microphone for truly great audio. The benefits of the Dual Pixel CMOS is clearly visible in videos when focus on subjects is a critical element. On the EOS 70D, the Dual Pixel CMOS makes sure that the focus in videos is very precise yet natural, even when switching between different subjects. Combine that with Movie Servo Autofocus and you get a smooth and consistent focus throughout your recording. The EOS 70D comes with Wi-Fi integrated into the system allowing you to seamlessly share and preview videos on your iOS or Android-based mobile phones and tablets, and, also allows you to control the camera right from the screen of your mobile phone. DIGIC 5+ with 20.2MP APS-C CMOS sensor. Up to 7 frames per second shooting at continuous recording. Comes with 19 point cross-type AF System. Records excellent Videos at all lightning conditions. Great Wide Angle shots will require a separate lens. 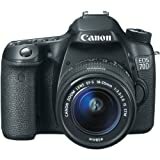 The Canon EOS 70D is a perfectly designed YouTube camera. It is lightweight, well priced and comes packed with great features. The Dual Pixel CMOS autofocus is excellent and considering the price point of the camera, you get a pretty great deal. Now although the EOS 70D is pretty great, our official recommendation would be to get the 80D if it works with your budget as, naturally, being the successor, it does sport better features. The Canon EOS Rebel T6 is yet another great offering from the Canon Rebel Series. The price of this camera is set in the entry-level range, making it a great choice for you if you’re just starting out on YouTube and want to wait to invest in more expensive tools. Now it may look a little weak, especially coming in right after the 70D and 80D respectively, but if you’re not going to be filming crazy action shots, then the Rebel T6 would work just fine and also cost you almost half the price of an EOS 80D. A low price tag doesn’t necessarily mean outdated and limited features. Here’s a quick look at what the Rebel T6 has to offer. 3.0 inch 920K dot LCD with clear and vibrant colors. 18MP APS-C CMOS Sensor along with DIGIC 4+ Image Processor which we got to see on the EOS T5. 9 Point Auto Focus with center cross type. Capable of 1080p recording at up to 3 frames per second. Intelligent auto basic mode and some creative modes. The Canon Rebel T6 is the successor to the Rebel T5 and has the same sensor along with a whole bunch of other similarities. If you are looking for an excellent entry-level camera for YouTube, then look no further. The colors are bright and the 9 point autofocus is brilliant. You do get some pre-loaded creative odes, which are pretty great if you need to use them. In terms of video quality, the Rebel T6 can record 1080p videos at 60 frames per second which is pretty decent. The videos recorded are sharp and look pretty great. Surprisingly, even at the price point, you manage to get the Digic 4+ Image Processor which is fast and processes hefty data without any issues. The camera comes with an 18MP APS-C CMOS sensor that captures excellent quality videos at up to 1080p. The camera is good for shooting light action shots with its capability to record up to 3 frames per second. The Canon Rebel T6 does not have a microphone input, which means the audio would be directly recorded from the inbuilt microphone. Though the unbuilt microphone works good, the external microphone records much clear sound. Integrated with Wi-Fi and NFC you can create a connection between the camera and your smartphone, again, giving you control of your camera right from your mobile phone. Wi-Fi and NFC capability also allow for seamless sharing of content from your camera to your phone. Full 1080p HD recording at 3 frames per second. Intelligent and creative auto modes. Accessories that come along are not the best quality (tripod, bag, and strap). We’ll keep it short – this camera is a great, entry-level camera and comes bundled with everything you need for Vlogging or creating videos for YouTube. Super easy to use and a great camera to start learning on. Next up is the D5300 from the Nikon D series and though it is slightly more expensive than the D3300 it does come with some major upgrades. The D5300 is another mid-budget camera from Nikon that can record brilliantly focused videos at up to 1080p. If you weren’t quite sold on the D3300, you should definitely check this one out. The upgrades on this camera are pretty big with the price not being much higher than the D3300. 24MP CMOS Dx-format sensor with no optical low-pass filter. 39 Point Auto Focus technology with 3D Matrix and 3D tracking. 5 frames per second shooting on a continuous recording. 3.2 inch Vary angle LCD with 1037k dots. When it comes down to the autofocus, D3300 pales in comparison, plus with features like 3D matrix and 3D tracking you get even better visuals. The Nikon D3300 and the D5300, are practically one of the best entry level DSLR cameras from Nikon. When compared to the Rebel T5 and T6, both of them come with a mic input allowing you to connect an external microphone to the camera. Both cameras come with better autofocus when compared to the Rebel series and yet have a similar price point. If the brand name doesn’t matter much to you, we would definitely recommend choosing either the D3300 or D5300 from Nikon over Canon’s Rebel T5 or T6. The sharpness, clarity, and richness of colors on videos recorded through the D5300 are astonishing. The 24.2MP DX-Format CMOS Sensor records the best lifelike videos, which are an absolute treat to watch. With integrated Wi-Fi and GPS, you can share your videos to your mobile phone or tablet with just a click and like some of the other cameras mentioned on here, you again have the capability to monitor your videos and control your camera right from your mobile phone. The Nikon D5300 is not just powerful but is also very lightweight and compact. Like every other DSLR from Nikon, the D5300 is designed to be intuitively ergonomic. Every button is placed within comfortable reach ensuring efficient operation. The best thing about the camera is, of course, its price tag. It is pretty under-priced at the mid-level range and does a fantastic job considering. 3D tracking and 3D matrix metering II. Built-in Wi-Fi for sharing and remote control. Autofocus only works with AF-S or AF-I lens. AF or AF-D lenses will not work. If you can invest some extra bucks, then we would absolutely recommend the D5300 over the D3300. For the extra amount, you do get pretty big upgrades in terms of the sensor, point focus system, and, of course, the 3D features it comes packed with. The Go Pro brand has been at the forefront of producing high-quality action cameras through recent years. They are known to produce great cameras that are small, compact and pretty much indestructible. The GoPro Hero 4 was one such innovation from GoPro. It was the first GoPro action camera that came with a capacitive touchscreen LCD at the back. And although they did go on to launch the Hero 5 and 6, the Hero 4 Silver remains their most popular action camera. It comes with a built-in touchscreen display for video monitoring, adjusting settings and shot framing. Its 12MP Sensor captures professional 1080p videos at 60 frames per second and 720p videos at up to 120 frames per second, which is pretty brilliant in our opinion. With Inbuilt Wi-Fi and Bluetooth, you can remotely control the Go Pro Hero 4 through the GoPro App. Built-in touchscreen for easy camera controls, playback and shot framing. 1080p, 720p and 4K video recording options. Night photo and Night Lapse Mode. Auto Low light mode for better low light performance. Captures 1080p60 and 720p120 with amazing clarity. The new Hero 5 and Hero 6 cameras that came after are priced a little higher than the Hero 4 but you, of course, get a few upgrades, both in terms of design and functionality. Software installed on the Hero 4 Silver comes with 3 modes: narrow, medium and wide. 1080p video recording is available at 60 frames per second for slow-motion videos and 720p recording at 120 frames per second for even slower motion videos. With the GoPro app and GoPro Studio software, you can remotely control your camera using your mobile phone and tablet. You can also view and share your content and watch your videos on the GoPro Channel and use the GoPro studio to edit and design excellent videos. The GoPro Hero 4 Silver is the first GoPro camera that comes with a touchscreen display which makes it very easy to view videos, edit settings and adjust focus. It also comes with new experience enhancing features like Highlight Tag that can mark key moments for easy playback. The GoPro Hero 4 is also waterproof up to 40 meters, which is a pretty major advantage for an action camera to have. The GoPro Hero does offer 4K video recording, but that’s only up to 15 frames per second, which isn’t the best rate for a 4K cam. However, if you’re mostly going to be recording in 1080p, then the GoPro Hero 4 Silver would make the right camera for you. If, however, you would like the added functionality of the 4K, then you’re better off getting either the Hero 5 or the Hero 6. GoPro Hero 4 features an enhanced sensor that delivers better image quality than any of the GoPro cameras released before it. ProTune unlocks the full potential of the GoPro Hero 4, delivering slightly compressed, cinema-grade video ready for professional production. Customize your settings for color, brightness, white balance, saturation etc., and enjoy the manual control available with the camera. Capacitive touchscreen display for easy controls. ProTune and SuperView for cinema grade capture. Durable build quality that can survive almost anything. Waterproof at up to 40 meters. 4K option can only shoot at up to 15 frames per second. 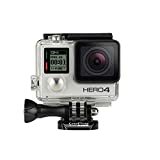 GoPro is an action camera manufacturer, and the Hero 4 silver is one of the best cameras from their very popular Hero series. Packed with everything you need to record high-quality action videos, the camera is also waterproof at up to 40 meters and comes with a touchscreen display. Who needs a camera for youtube? Anybody who looks at YouTube as a career option, could get a YouTube Camera. But, that doesn’t mean it’s a necessity, and you can not start your Youtube career without a professional camera. You can start creating videos right away with your mobile phone, and pick a high-end camera once you can afford it. There is a lot of wrong beliefs on this. Aspiring YouTubers never get started thinking that a professional camera is must, while not realizing that you can shoot good videos with the modern-day smartphones. Not just one, but there are so many successful YouTubers, who kept it low profile at the beginning and now are a million subscribers. Yes! having a camera is a big advantage, but in the end, it’s all about the quality of the content and your passion towards it. Even before looking out for prospected cameras, we decided not to add any digital cameras on this list. For filming, we decided to add DSLR & Mirrorless cameras, while for vlogging we thought point and shoot, and action cameras would be the best. When it came to choosing, we started looking for products that were already popular among the users. For example Canon EOS 80D & G7X Mark II. We then looked for products that were not very popular, but popular enough to deserve a review. If a product is new in the market, but we see good value in it, we review it. We have actually discovered a lot of great products by doing this. We then consulted reviews on other large publications and also read legit customer reviews on sites like Amazon and Best Buy. We neglect products that come with poor reviews, while we consider products that have mixed reviews. From there on we looked at the specifications of all the products, and checked if they come with all the important features we need them to have. For example, 4K video recording was not something we wanted ever camera to have, but it was important for every camera to have a microphone. Overall, we picked 23 cameras that had everything we need, and after reviewing all of them, we chose the 10 best YouTube cameras to be featured over here. Video Quality: We made sure that the cameras we are choosing produce excellent videos with atleast 1080P resolution. We chose a few cameras that offer the 4K resolution, but we never made it a priority because a very small audience watches 4k videos, most of them don’t go beyond 1080p. Low Light Performance: After testing so many cameras in the past, we realized that not all cameras offer great low light performance, and that’s why we made it a priority and manually checked the low light performance of every camera. Autofocus: A Video or a picture without autofocus in nothing. We knew it, and that why we tried to take cameras into consideration that come with a decent focus point that offers good focus not just during normal filming, but also during high-action videos like sports and wildlife, that demands good fps at continuous shooting. Microphone: Apart from having a microphone jack, a camera must have some kind of microphone built in. We rejected so many great cameras because they were missing an in-built microphone. More details of the microphone could be found below. Buying a camera that covers your Vlogging needs can be a difficult task. Before you decide to invest in one, you need to be clear about what you need. On our list here, we have cameras under both low and high budget. Since videos on YouTube do need to be professional looking, we have not included any cheap cameras, since they may not be able to produce videos of at YouTube level quality. The camera you ultimately get depends on a wide range of things, primary being your budget. If you’ve got a tight budget and basic requirements for a camera, you, of course, should get one of the lower priced cameras on this list. Conversely, if you want advanced features and specifications and price is not an issue, you could get one of the more premium cameras on this list. “YouTube Videos” are pretty hard to generalize and buying a camera for YouTube depends on what kind of videos you intend to shoot. If you are just starting out and are looking for a basic, functional camera then an entry level DSLR would be suitable. If, however, you are into recording sports/fast action videos, then you would need a camera with higher frames per second rate. Ultimately, it does come down to what you intend to do with your camera and the kind of content you plan on creating. Budget is a critical factor when it comes to buying pretty much anything. In order to make the best purchase that you can, due diligence is crucial. When it comes to YouTube Cameras, an approximate $500 would be a pretty decent budget to work with giving you a few really good camera options that can record high-quality 1080p videos. 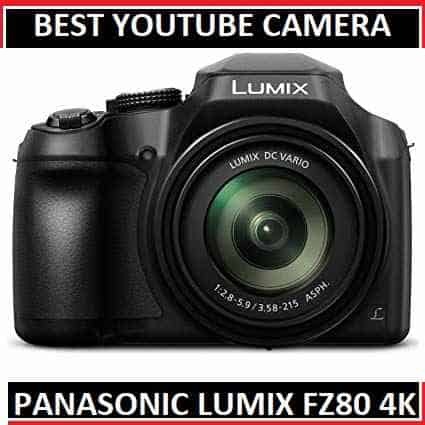 You can also get cameras that have 4K functionality at this price as with the Lumix Fz80 that can seamlessly record 4K videos. Truly professional grade cameras are hard pressed to be under $1000 whereas premium, high-end cameras can run into a couple of thousand dollars. In order to make deciding easier, it is vital for you to first set your investment price point. Ask yourself, what type of Youtube camera do I need? What are my actual requirements? We see so many people reaching for a high-end professional camera without identifying their actual needs. Are you planning to record fast action videos? Are you planning to record 4K videos? Are you planning to record slo-mo videos? These are the type of questions you need to ask yourself, else you end up with an overpriced piece of equipment that you don’t need. Elaborating further, if you are planning to record some action videos then you surely need a high-end camera that could shoot videos at high FPS. But, if you are planning to record normal stuff, then that high-end camera would be irrelevant. Camera relevant for Vlogs: When it comes to vlogging, always choose a point and shoot camera. Those cameras are portable and lightweight and offer great video quality. Some Point and shoot video cameras like Lumix Fz80 can also record 4K videos. Camera relevant for adventure Vlogs: Action cameras are the best type of cameras that could be used for filming adventure vlogs. They are small, water resistant, and could be easily mounted anywhere. We recommend Go Pro Action Cameras. 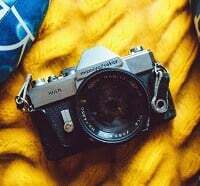 Camera for normal filming: For general filming, you can either go for a DSLR camera or a Mirrorless camera. Mirrorless camera was recently introduced to the market, that comes with all the awesome features of a DSLR camera, but is very compact as compared to them. Both types of cameras offer excellent videos with great Autofocus. Sony a7r ii and Canon EOS 80D are our most recommended cameras. What are the different types of Video Cameras available? There are mainly 4 types of videos camera that are great for recording YouTube Videos. The best and the most powerful camera type in the market, these are highly recommended for pretty much everyone unless you specifically have decided on another type of camera. DSLR cameras are upgraded version of SLR cameras that also come with a digital image sensor. Both of them run on the same mirror mechanism. A mirror that is placed inside the camera body reflects the incoming light to the prism through the lens, then to the viewfinder for previewing. Mirrorless cameras are the latest trend in the market. They are as powerful as DSLR camera and are very compact in nature. In a mirrorless camera, light passes directly from the lens to the image sensor, which displays it on the rear screen. The only feature where DSLRs outperform Mirrorless cameras is the Autofocus. DSLR cameras come with a really great autofocus system that is fast and very accurate. Though few of the modern-day Mirrorless cameras like Sony A7r ii offer great AF, there is still a long way to go. A very compact option for someone who likes to travel a lot and doesn’t want to lug around bulky DSLR cameras. In reference to youtube, these are ideally suited for Vloggers. Since they are lightweight and small, vloggers can easily carry them anywhere. They are not suitable for recording high action shots and don’t have any advanced autofocus system, but for recording vlogs, they do a great job. Cameras built for adventures and fast action shots. The GoPro series is a perfect example of action cameras. Action cameras are the smallest type of youtube cameras. They get mounted everywhere, are waterproof and are usually built of solid materials. But remember, action cameras are only good for adventures. You can not use them for normal filming since they don’t come with Autofocus technology. We’ve decided to keep this list pretty broad and have included all 4 types of cameras: DSLR, Mirrorless, Action, and Point & Shoot cameras. DSLR cameras are capable of performing well in every situation and are pretty well known for recording high-quality Videos. Point and shoot cameras, on the other hand, are very portable cameras and fit very well into compact spaces such as pockets and shoulder bags making them pretty easy to carry around and the perfect choice for people who don’t want to lug heavy DSLR cameras around. 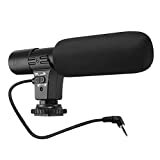 An important thing to keep in mind while buying cameras is that regardless of the microphone capability on cameras, you will ultimately need a dedicated microphone if you are going to make audio heavy content. Keep this in mind as you work out a budget since great microphones can cost a pretty penny as well. What Cameras are Suitable for Vloggers? We have said it a lot of times, and we would say this again. If you are a vlogger, go either with Point and shoot cameras or action cameras. Action cameras are usually used by vloggers who are into adventure, but they can be used for normal vlogging too. The best thing about Action cameras is their size and portability, plus they are affordable too. Point and shoot camera, on the other hand, are not as small as action cameras but are still very compact. The best example for that would be Canon Powershot G7X Mark II. DSLR cameras would be a bad choice for vloggers due to their overall size and weight. As compared to Point and shoot, and action cameras, Mirrorless cameras and DSLR cameras have larger sensors. And, larger the sensor, clearer the pixel quality. Most cameras will perform exceptionally well in broad daylight or in good lighting scenarios, but when it comes to low light situations, some may give up or produce poor or average results. In our opinion, a truly great DSLR camera should absolutely perform well in low light, opening up the different scenarios in which you can shoot, be it night time or dark indoors. Make sure to check out some sample videos shot through the camera in low light conditions. These can easily be found in review sections uploaded by previous buyers, or on YouTube review videos. We can all agree that sound is a vital part of video making. And while an external microphone is your best bet and great audio quality, you cannot always lug your microphone everywhere. This means you have got to sometimes rely on the built-in microphone on your camera. At times like these, you need to ensure you’ve got a pretty great microphone. The cameras on our list go up to 60x when it comes to zooming, but a great range on most cameras is up to 10x. The zoom feature should be on the top of your priority list if you plan on shooting outdoors. You want to make sure that zoomed in videos appear as clear as regular ones in order to determine the quality of the camera. One of the worst things that could happen to a YouTuber is if their camera were to suddenly die right in the middle of recording a video. This can be extremely stressful and a major hindrance. In order to assure you don’t find yourself in such a situation, we’d recommend not getting any camera with a battery life less than 3-5 hours. You will rarely have the opportunity to be able to charge your camera once you’re outdoors making it difficult to Vlog the entire day. If, however, you find yourself needing more juice, try and carry spare external batteries to combat this. What’s Up with 360-degree cameras? In the past few years, 360 videos have got quite popular. Some people confuse 360 videos with VR, but both of them are completely different. VR is a computer-generated content that is edited by a professional creator to make it that way. 360 videos, on the other hand, are directly recorded from the wide angle lenses. A 360 video is a great experience, but you are stuck at the camera’s perspective. While in VR, you see any perspective just with your head movement. A normal Youtuber cannot create VR videos but could create 360 videos. There are a lot of 360-degree cameras in the market now. We also have a GoPro Fusion 360 camera, but we didn’t like it much. From what we have seen and tested, cameras from Insta 360 are good cameras. We recommend Insta 360 One X, which is a portable camera that comes with flow state stabilization. 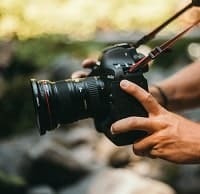 What Camera accessories do I need? There are a lot of camera accessories you can get to make things convenient for you, but today we are going to talk about the accessories that are an absolute must. Camera bags come in as very handy when you are traveling from one location to another with your DSLR. Moreover, the bag adds an adequate amount of safety as well. There are many types of camera bags available in the market, and often youtubers end up choosing a wrong bag (mostly in terms of size). Users usually buy a bag looking at the current requirement, which usually is a camera and a lens. But with time, a lot of other accessories get along, and the bag ends up being too small to carry everything. So instead of spending money like this, you should choose the right bag from the very beginning. We personally recommend backpacks, as they are large and convenient to carry. A tripod could be very helpful for stable video recording or photography. But make sure you are getting a quality one. 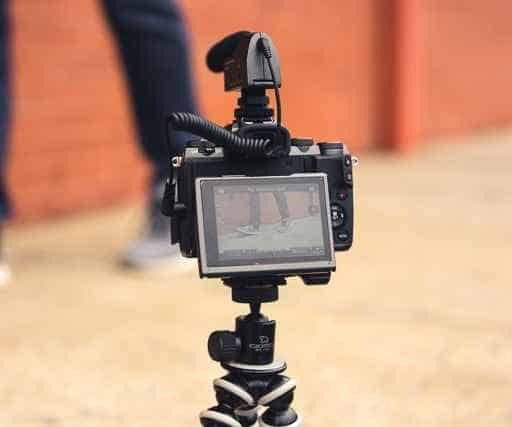 A poor quality tripod might not be able to resist the weight of the DSLR, and this could be the reason for your DSLR falling off and taking damage. When choosing a tripod, make sure one you are finalizing can handle atleast twice the weight of your DSLR and lens. You should never rely fully on a single battery. Camera batteries don’t have much power and hardly last for around 3-4 hours. So, In general, you should always carry an extra battery in your bag. Even if you are not planning to shoot outside for long, you must still carry an extra battery and never take the chance. Pro tip: Batteries drain up much faster in cold temperatures, so make sure you are prepared for that in cold weather areas. Glass placed at the front of the lens catches dust, resulting in capturing cloudy-looking videos. Therefore, you should always make sure that the lens front is fully clean with no dust particles on it. We have tried multiple cleaning cloths in the past, and have found out that Magicfibre microfibre cleaning cloths are the best. If you are going to get a DSLR or a mirrorless camera, make sure you also get a comfortable strap with it. A camera + lens combo is heavy and carrying it around with a normal strap could be painful, and might leave some bruises on your neck. A comfortable adjustable strap would allow you to carry the camera around your neck without any issues. We would say this is the must-have camera accessory. 1080p FHD videos take a lot of space, and you can’t store all of that in a single memory card. You must always carry atleast one extra memory card with you. A 32GB memory would do the job, but we usually recommend getting atleast a 64GB of memory card. Also, you need to make sure you are getting a branded memory card that has high read/write speed. If you view and edit videos on the go on your laptop, then a memory card reader is a must. There are several types of memory card readers in the market with different speed and different types of slots. Having a memory card reader that can read multiple memory cards at once is always a good idea. If your laptop only has a C-type port then make sure you are buying a C-type card reader. How do you Edit Youtube Videos? Creating a good youtube video not only involves shooting, but also some good editing that is also known as a post-production process. The editing process usually involves cutting down the not needed scenes, adding various effects, adding background music, and a few other things that would make the video awesome. Back in time, editing videos was a costly process. You had to hire a professional to do the job. 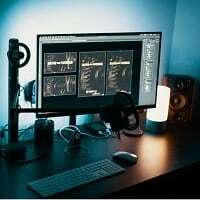 But now with so many modern tools in the industry, anyone can be an effective video editor (of course with some practice). To be able to edit videos, the first thing you need to do is get a video editing tool. Currently, for Microsoft, the best video editing software is Adobe Premiere Pro, and for Apple, it’s Final Cut Pro. But they are also quite expensive, and also quite complicated. They are also a few of the free tools like Windows movie maker and iMovie that do a satisfactory job. Once the video editing is complete, you need to choose a file format. Youtube accepts all the format of videos, but we still recommend to stick with .avi or .mp4, and always render your videos in 720p or 1080p High definition. Different youtubers use different cameras, but as per our research two of the cameras that are most common among Youtubers are Canon EOS 80D and Canon Powershot G7X Mark II. What Cameras do Vloggers Use? Most of the Vloggers use Canon Powershot G7X Mark II point and shoot camera. 4K videos are much sharper as compared to normal 1080p HD videos, that’s a fact. But how many users on youtube actually stream videos at 4K? A very few indeed. So if your only motive is to make videos for youtube, then a 4K camera is not actually needed. Can I use action cameras for filming? As compared to DSLR cameras, action cameras don’t perform great in low lighting, and also don’t have good focus. So if autofocus and low lighting performance are on top of your priority list, then you shouldn’t choose action cameras for normal filming. Action cameras are ideally built for recording vlogs. What Editing software do Youtubers use? Most of the Youtubers use Adobe Premiere Pro for Windows, and Final Cut Pro for Mac. Thank you for this epic article. I want to start shooting travel vlog. 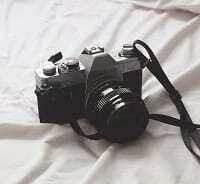 So, what is the best camera for this? For vlogging, there is nothing better than a Go pro. Your post has given me a very special impression, unlike other posts.